I know this is very difficult to believe, it’s tragic, it’s also scary, but even if you are not completely convinced that this is true, please exercise caution with these Word of Faith preachers as well as the New Apostolic Reformation , and all of those that have good connections or alliances with them. People usually take time and check every detail when buying a car or a house, how much more should we do when choosing a teacher of God’s Word, right? The Word of God tell us to test the spirits in 1 John 4:1, are we doing it? IHOP ended up buying Truman’s property. 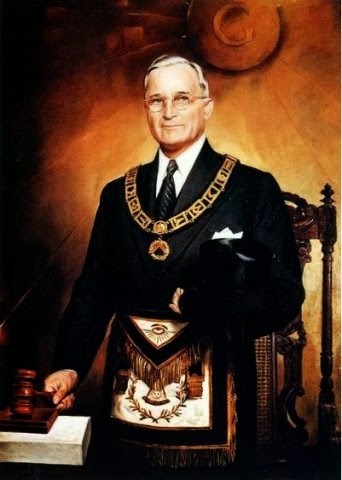 But what they don’t mention is that Truman was a 33o Mason. The complex have a street named Harry S. Truman Drive, a new Truman Prayer Centre that was scheduled to open on summer 2013, and a Truman Corners Shopping Center. (Later phases call for dorms, a hotel and office towers, said Erin Bardon, who is not an IHOP member but an architect in the project). 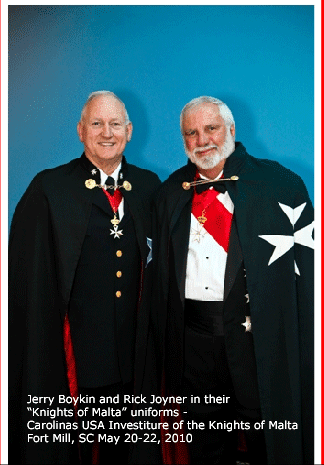 The grand master of both Rick Joyner & Boykin, Nicholas Papanicolaou is a Mason member of the Masonic Order of Amaranth, Also the Knight of Malta Cross and the double headed eagle are both Masonic symbols, as well as are their ceremonies, protocols, etc. The principal requirements to enter the Order are: (i) a strong commitment to the Roman Catholic religion and (ii) having achieved distinction in civil society. (like masons or militaries). Papanicolaou & Boykin work closely with Rick Joyner in his Oak Initiative. 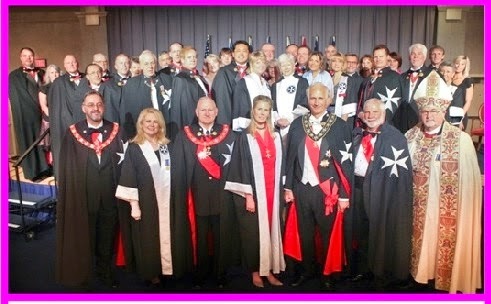 In their page you can find that all their leadership and board of directors are part of Billy Graham’s ecumenical Lausanne Covenant, and many of them, if not all, are also masons. Pagan origins of the Cross pattee or Cross of Malta. Knights of Malta use a white cross & Knights Templar use a red cross. 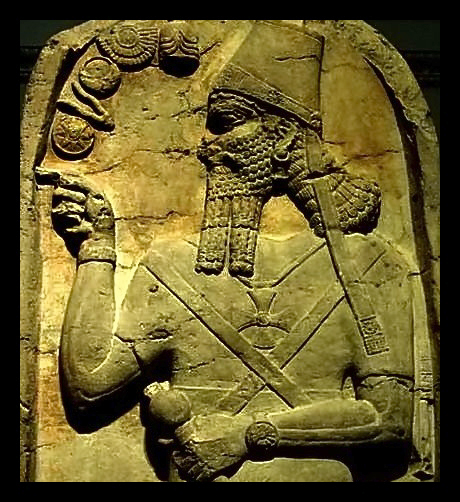 Assyrian (Babylonian) King wearing on his chest a Maltese cross (cross pattee) symbolic of sun worship. Rick Joyner Knight of Malta. In Moravian Falls, North Carolina, Rick Joyner has shared that he and his staff have had numerous angelic visitations on their property that was once owned by Count von Zinzendorf and the Moravian community of faith. They say several portals exist on this land which had been prayed over by the Moravian brethren for over 100 years. here. Also check Mike Bickle, Rick Joyner and their adoration of Count Zinzendorf & Moravian . Count von Zinzendorf was part of the aristocracy & was involved in a Masonic Order, a Rosicrucian, and used metaphysical rituals he learned from the Kabbalah, check here. 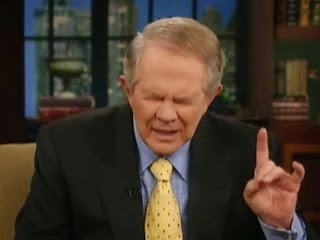 He started the prayer movement of 24/7 that Mike Bickle and Peter Grieg revived. He also started the Order of the Mustard Seed. Abu Ghraib is an ongoing evangelical Hell House, & Was Torture really Part of Religious Crusade?. “33 Mason, Manly P. Hall writes that Hiram Abiff is symbolic of the Spirit Fire of the Kundalini of Hindu mysticism. This is an extremely dangerous occult practice and shows the very real danger of coming into contact with demons during occultic initiations” Ritual abuse. 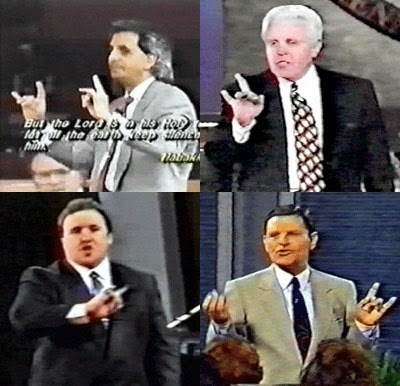 It was back in 1991 at a Benny Hinn Crusade that we see some children chuckle and Rodney Howard Browne is on stage and called forward by Hinn. 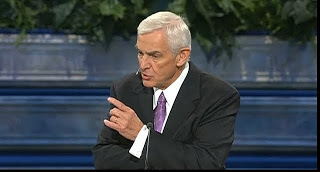 “Rodney, God has given you a great anointing for this ‘ referring to the laughter anointing. So was Benny Hinn who gave Rodney the laughter anointing, from there to Randy Clark, Toronto Blessing etc. Also notice how a word is repeated many times. Repeating over and over a word is called mantra in New Age, a technique used to enter into a “trance” or altered state of consciousness, also used in hypnosis. Rodney says he is the Holy Ghost bartender. (Update: This is the 3rd time in less than a month that this video is deleted from a different youtube account, but you can find a similar copy of same crusade, not as good quality here). This other video is reporting the death of 2 employees of Benny Hinn in the local news . 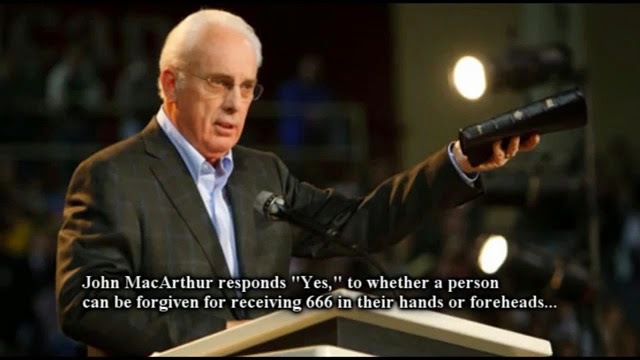 John MacArthur a 5 point Calvinist (Reformed Theology) teacher, has a good reputation as being doctrinally sound. To know more about what a Calvinist believe please go here & here. I’m not stating he is or is not a Mason but that certainly he has good connections with them and you can make your own conclusions by reading the links below. I know this may shock & upset many, but we don’t follow men but Christ. This is not a personal attack on Mr. MacArthur’s character, his sincerity, his salvation or Christian experience. I am interested only in the soundness of his doctrine, whether or not his statements are true, especially because he’s a very popular bible teacher. His spiritual mentor was a Jewish Rabbi. There is a lot of controversy on his teaching regarding that the Blood of Christ doesn’t save us, but is just symbolic of His death. See also here. Even he often preaches against ecumenism, MacArthur frequently speaks at ecumenical forums, such as the Moody Bible Institute Founder’s Week. 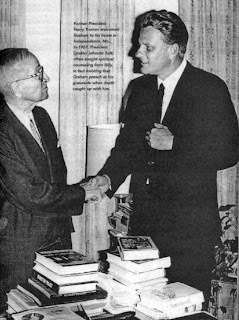 For example, at the February 1986 Moody Bible Institute conference, MacArthur joined hands with two of the chief ecumenists of our day, Billy Graham and Luis Palau. 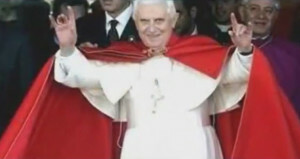 Both Graham and Palau regularly join together in ecumenical relations with Roman Catholics. In July 1988, MacArthur spoke at the Congress on the Church and the Disabled at the Billy Graham Center at Wheaton College, which featured Roman Catholic and New Evangelical speakers (Moody Monthly, Oct. 1988). But he still speaks in the Moody Bible Institute until today, here is their conference in 2013. More on MacArthur teachings & recommendations. Video Documentary : Did Augustine Corrupted The Church With Gnostic Doctrine?